Thomas Williams, 54, of Blackwater Road, Eastbourne, was found guilty of assault by beating. The offence took place at Eastbourne on February 5. He was fined £180 and ordered to pay £100 in compensation and £300 in prosecution costs. The court also made a community order with a condition banning him from entering the London and County pub, in Terminus Road, for 12 months. Stephen Obertelli, 55, of Cavendish Road, Eastbourne, was found guilty of assaulting a woman by beating her. He was fined £340 and ordered to pay £620 in court costs. Magistrates did not think a restraining order was necessary, saying it was an isolated incident and that he has no history of violence. 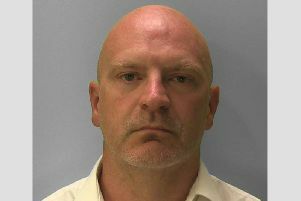 David Phelps,44, of Pensford Drive, Eastbourne, pleaded guilty to assaulting a woman by beating her. The offence took place at Eastbourne on May 4. He also pleaded guilty to damaging a door lock and two further charges of assaulting women on the same date. He pleaded guilty to assaulting a man by beating and to being in possession of cannabis resin on May 4. The court made a community order with an alcohol treatment requirement and ordered him to pay a total of £300 in compensation. He was fined £80 for the drugs offence and the court also issued a restraining order. Liam Williams, 21, of St Mary’s Avenue, Hailsham, pleaded guilty to driving a Vauxhall Corsa on Arlington Road, Hailsham, on April 16 with cocaine in his bloodstream. He also pleaded guilty to being in possession of a quantity of cocaine. He was fined a total of £450 and banned from driving for 18 months. Luke Davis, 36, of Faversham Road, Eastbourne, pleaded guilty to breaching a non-molestation order by sending numerous text messages. The offence took place at Eastbourne between December 17 last year and February 27. He was given a 12-month conditional discharge. Tadeusz Fijalkowski, 57, of Staveley Road, Eastbourne, pleaded guilty to driving a vehicle on Seaside Road, Eastbourne, on June 12 while nearly three times over the drink-drive limit. He gave a breath alcohol reading of 102 microgrammes. The legal limit is 35mg. The court made a community order with a requirement of 120 hours of unpaid work and banned him from driving for two years. Evija Kepala, 34, of Grove Hill, Hellingly, pleaded guilty to assault by beating. The offence took place at George Street, Hailsham, on June 8. The court made a community order with a 12-week electronically monitored curfew between 8pm and 6am.